For this week, I’ll concentrate on Dr David Hitchcock and my ‘Walk through the Walls’ tour in Canterbury last Tuesday as part of the BeingHuman2018 Festival. 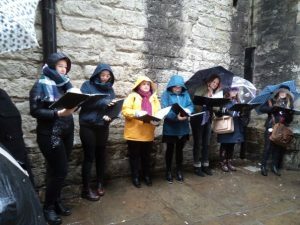 The weather was horrible – wet, cold and windy, but we met about 15 intrepid students and members of the public at the Westgate where we were joined by ‘Top Voices’ a group of Canterbury Christ Church music students under Dr Chris Price’s direction. After a brief introduction about the theme for this year’s festival by David, who explained that under the idea of ‘endings’ we were looking at vagrancy, crime and punishment, Top Voices gave us a beautiful rendition of the early modern ballad ‘The Hanging Tree’. We also mentioned that the Westgate Towers had been used as the city’s prison from the later Middle Ages through to modern times. Among the debtors housed there not long after the Westgate had been built (around 1380) was Isolde Stafford, a tapster and defendant in a debt case in 1417 who died there. It is also worth noting that during this same period this was not the only prison in this part of Canterbury. In the Middle Ages the archbishop’s prison had been in Westgate mill just over the River Stour and in later times the county prison had been in Westgate Street, not far from the Roper’s great house whose early Tudor brick gateway still survives. Indeed, the county jail in Westgate Street had remained in use until the early 19th century. Leading the group with David as our back marker, I headed down St Peter’s Street to the High Street, passing the site of the Guildhall where the city’s aldermanic bench had met over the centuries to consider the fate of those incarcerated in the Westgate. 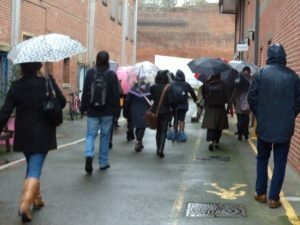 We then headed down Mercery Lane to the site of the late medieval/early modern Bulstake (its present name the Buttermarket is exceedingly modern). Having drawn attention to its use as a place where bulls were baited before slaughter, I explored how it had been the site of execution on a very particular occasion. For Nicholas Faunt may have the dubious distinction of being the only mayor to be executed in the heart of his own city. This civic space – used as a market area and for proclamations, as well as bordering the cathedral precinct, would have resonated with all those who gathered on that fateful day in May 1471 to witness the mayor’s demise. Among those probably present were King Edward IV, Faunt’s peers, his son and many Canterbury citizens – a gruesome end to the city’s involvement in the Fauconberg Rising, although the city did not regain the king’s favour until the end of that year. For those interested in finding out more about the city’s role in this episode in the Wars of the Roses, check out ‘Those who marched with Faunt: reconstructing the Canterbury rebels of 1471’, Southern History, 39 (2017). Next we headed down Burgate Street (not far from the city’s 16th-century pillory in Rose Lane) before passing beyond the city walls by what had been the site of Newingate (almost a mirror image of Westgate but built about a century later). Walking up Dover Street (Anglo-Saxon ‘Rithercheap’), we arrived at Oaten Hill the location of one of the city’s ‘hanging trees’. Like the several jails, Canterbury had employed several places of execution – gallows in the castle ditch, at Hollow Lane, in the ‘Dungeon Fields’. Drawing on material collected by the Oaten Hill and South Canterbury Association’s history group, I described how the first person hanged at Oaten Hill a year after the gallows had been erected in 1576 was a widow called Elizabeth Burrell, who had been convicted of killing her child. Thereafter this was the city’s favoured place of execution during the 17th and 18th centuries, the last recorded hanging having taken place in 1783. The person concerned was a 39-year old soldier called Thomas Stokes who had been convicted of robbing a local young gentleman. Indeed, it was the local nature of the crime that had led to the sentence being carried out in Canterbury because after the Assizes moved to Maidstone in 1741 executions were generally carried out there. As David then mentioned, this topographical link between crime, criminal and punishment was behind Alice Arden’s execution at Canterbury, for she and her lover Mosby had murdered Thomas Arden in the couple’s house at Faversham. Having been convicted of petty treason – killing her husband, she was burned at the stake, although where this took place in not known. This mid-16th-century case was notorious, the gory details of the murderers’ plans immortalised as a play (printed in 1592), which has been performed numerous times over the centuries, and is well worth seeing if you get the chance. David Hitchcock took over leading the group as we headed to Canterbury Christ Church to meet up with Top Voices at the Travellers’ Wagon. 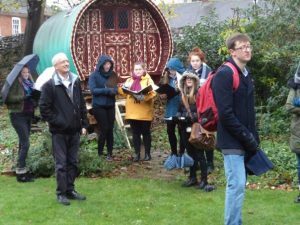 By this time the weather had improved slightly, and, as we gathered in front of the wagon, David explained the difficulties travellers or gypsies, as well as vagabonds, had experienced in the early modern period. 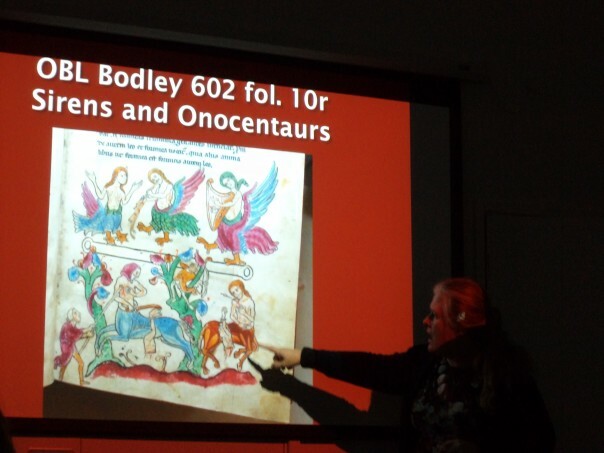 We discussed the various names given to travellers during this period, and that although most had originally come from central Europe, especially Romania, they were frequently labelled ‘Egyptians’, a term seen in the later 16th-century Canterbury civic records. David described how they sought work as entertainers and tinkers among other occupations as they travelled about; and he also mentioned that there was the idea of the gypsy curse if people did not help them by offering employment or charity. This gave the link to Top Voices next ballad called ‘The Gypsy’s Curse’. At this point the weather got worse again so we headed off to our final destination, the early 19th-century county jail and house of correction, now closed and undergoing refurbishment by CCCU which owns the complex. Entering ‘B’ wing we were immediately confronted with a scene from ‘Porridge’, albeit without the prisoners. 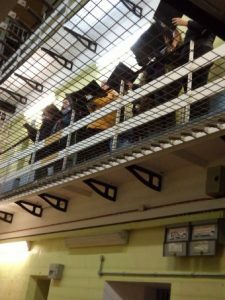 After David Hitchcock had introduced the idea of the prison’s uses and the types of people who had been housed there in its early days, Top Voices went up to the first-floor walkway to give us their final ballad. 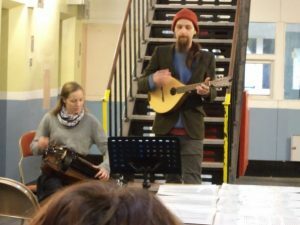 We then went further into the prison where we were joined by Professor Carolyn Oulton, the organiser of CCCU’s BeingHuman2018 events and ‘Greymalkin’, two professional musicians who specialise in medieval and early modern music. David introduced them, and they brought the Walk event to a fitting climax with a great rendition of ‘Trick for Tyburn’. I wasn’t able to attend subsequent events in the Festival at Folkestone and Margate, but I understand they were all very successful. 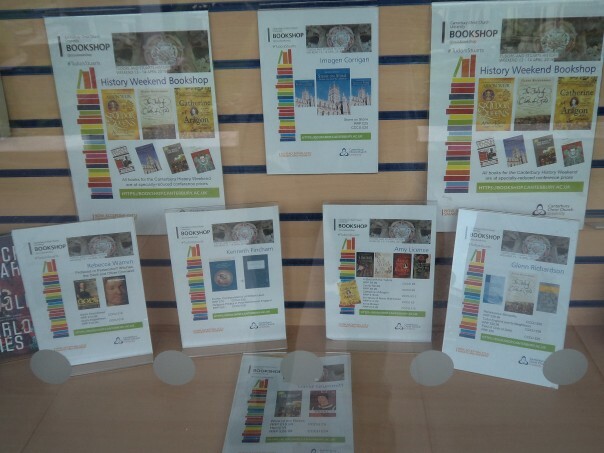 Talking of successful events, as well as the Becket Lecture this coming Tuesday, two days later the Centre will be teaming up with the Friends of Canterbury Archaeological Trust for a talk on Thursday evening. So, if you would like to hear Keith Parfitt (Canterbury Archaeological Trust) resolve the mystery of a lost Anglo-Saxon cemetery at Old Park Hill, Dover, do come along to Newton Ng07 for 7pm, all welcome.